This week it’s wage inflation, but with a particular twist. Utilizing the great indicators from the innovative economics team at the Atlanta Fed, I have built a new indicator which I call the “Stay or Go Indicator”. It is the difference between the annual wage growth figures for ‘Job Switchers’ vs ‘Job Stayers’. In short, it is basically a measure of how much better-off those who are switching jobs are vs those staying in their jobs. Logically this indicator will give higher readings when the job market is tighter. The chart comes from a report on the outlook for inflation in developed economies and the USA in particular.As I mentioned, the Stay or Go Indicator will give higher readings when the labor market is tight (because employees typically have better bargaining power when the job market is tight, and usually it’s easier to get a pay rise by switching jobs because from an employer’s perspective they need to pay market rates for new workers but can usually get away with putting pay increases through at a slower pace for existing workers). By the way, this is not a discussion of whether YOU should switch jobs, or whether this dynamic is fair or not – we try to deal with facts impartially and see the world as it is here (and then act accordingly). 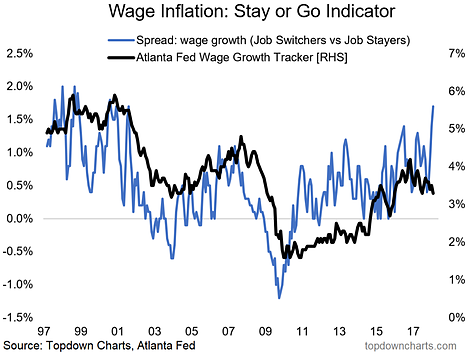 But anyway, delving into the actual usefulness of this indicator, you can see clearly that it appears to offer a slight lead on broader wage growth. Leading into the financial crisis you saw this indicator drop off quicker and more rapidly than the broader wage growth indicator. Logically, as the job market loosens up and supply of labor grows vs demand for labor, workers lose bargaining power, and may need to just take any job and down-weight the importance of a pickup in salary in that environment – and you see that in the indicator. The surge in the latest couple of readings for the indicator confirms what we’ve been seeing more broadly across developed economies, and that’s a tightening up of economic capacity – alongside fairly buoyant economic confidence and growth backdrop. That’s a recipe for higher inflation more broadly. The key implication being that the Fed pushes on with monetary policy ‘normalization’ aka tightening… and at some point, probably soon, will be joined by its peers across developed economies, as the prevailing global monetary policy winds turn from tailwind to headwind.